This may look like I had the foresight to create this tasty looking mini pizza. But no. This is a result of emptying out my pantry and fridge. After cooking all the meals for the week, I had some leftover small tortillas, leftover marinara sauce, leftover mozzarella cheese, and even a handful of leftover turkey pepperoni! The obvious conclusion was to make a mini pizza. This little experiment is out of the box for me because I never do anything without a recipe! We were pleasantly surprised by the outcome! I wasn’t sure if the tortillas would be sturdy enough so I doubled them up, and it worked perfectly! Trivia Fact: Before pizza started gaining popularity in Italy in the 1800s, it was considered a food eaten primarily by the poor. The dough was very cheap to make, and the toppings used were vegetables that were about to go bad (because they didn’t have refrigerators) and they didn’t want it to go to waste. So even back then, pizza was just a bunch of people cleaning out their pantries, like me! 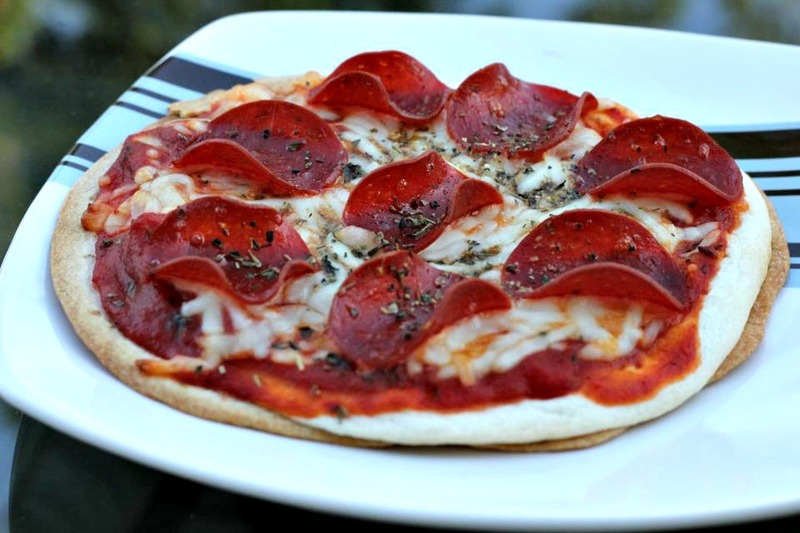 This is a very, very easy meal and your kids will love having their own little pizza! Shoot, if I had known about this in college, I would’ve thought twice before spending all that money on pizza deliveries where we only eat half the pizza and the rest just sits in the fridge. And pizza is never as good re-heated. You can obviously put whatever toppings you like on it, and make it your own. No more bickering about which toppings your family should put on the pizza. Each person can choose their own toppings for their own pizza! So the daughter who is a vegetarian can just put veggies on hers while your meat-loving husband can load up on the meat, and that picky toddler can have plain cheese. This is also a fun dish to let your kids help put together. Preheat oven to 375. On a greased cookie sheet, put 2 flour tortillas on top of one another. Repeat to make 4 pizza crusts. Put 1/2 c of the cheese onto each pizza. Cover with toppings of choice. Bake for 10-15 minutes or until tortillas are crispy. Season with Italian Seasoning to taste.